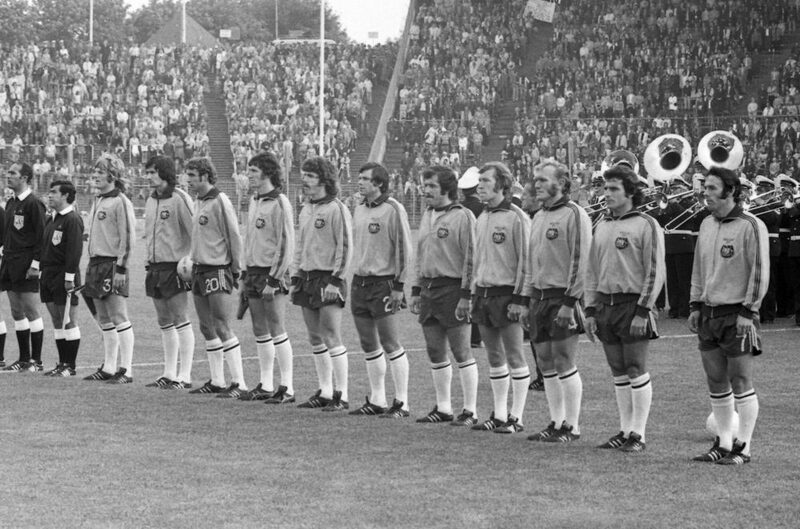 Before the Australian men’s soccer team’s first World Cup appearance in 1974 (pictured above), the team competed in war-torn Saigon. Young, ambitious Australians, playing for their country for free in 1967, didn’t know any better when they accepted an invitation to a soccer tournament — in Saigon. I heard this story on WBUR radio’s Only a Game. It is beyond amazing. “There was little time for the players to think about the potential dangers of sending civilians into a war zone. ” ‘Well, the first, biggest shock we got was the amount of armed people we saw — soldiers, sentry points all over the place,”‘ Stan says. “The players discovered the proprietor of their hotel had stolen their food vouchers, leaving them with nothing but substitute ham. And Stan received an electric shock, thanks to exposed wires in his room. Even the training pitch was questionable. “The tournament began with a group stage. Australia was drawn into Group A alongside New Zealand, Singapore and hosts South Vietnam. “The magnitude of Australia’s performance in the Friendship Tournament cannot be overstated. Not only did they perform on the pitch, but they did it in remarkable circumstances, and all for the honor of representing their country. Wow. More at Only a Game, here. It’s this sort of story that makes me love sports so much! Another wonderful story about soccer bringing people together 🙂 Loved it!